UPDATE: GIVEAWAY IS CLOSED! The winner is Amy M who said, “Ginger creams made with my daughter. Soft gingerbread cookies frosted with a lightly sweetened cream cheese frosting. Sprinkled with red crystallized sugar. Beautiful and soooo yummy. Hide them if you do not have good self control.” Congrats! We will email you! Thanks to everyone who entered! My all time favorite Christmas cookie would have to be my sisters Italian cookies. They’re so good they melt in your mouth. My favorite cookie is peanut butter blossoms! My grandma’s cut out cookies are my absolute favorite holiday cookie – there are no bells and whistles, but they taste just like home! I love to make decorated sugar cookies with my granddaughters. What a beautiful mixed! Favorite cookie for the holiday is meringue chocolate chip! Thanks for offering the giveaway! My favorite holiday cookies are ginger molasses cookies. my favorite cookie is your heath bar shortbread dipped in chocolate. I make it each year at Christmas. My all time favorite Christmas cookie is a Russian Tea Cake. My all time favorite Christmas cookies are gingerdoodles! My absolute favorite holiday cookies are peanut butter blossoms. My favorite cookie is a classic chocolate chip cookie! My all time favorite cookie to bake during the holidays is the snickerdoodle. have to be a snickerdoodle! my favorite Christmas cookie is my mom’s mint chocolate cookies. It’s a toss up between Buckeyes and brown butter snickerdoodles! Looking forward to finding some peppermint bark and giving this recipe a try! Love your site! Wish it were an app! My favorite all-time cookie is the basic sugar cookie. Hard to beat it! My favorite holiday cookie is a frosted sugar cookie!!! Yay! Raspberry thumbprint cookies with lemon zest! So good. These look super yummy!! Going to make them for my work cookie exchange. My fave christmas cookie are actually the peanut butter blossoms. Not sure if they are christmas exclusive, but my family makes them every year and they are SO good. Mine are a chocolate oatmeal crinkle that was on the quaker lid. We’ve made it forever. It’s hard to pick just one…it’s between peanut butter blossoms & my mom’s sugar cookies!! 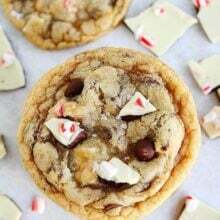 I can’t wait to make these peppermint bark chocolate chip cookies they might become my new fave!!! My favorite Christmas cookies arr Christmas Ginger Cookies! My mom’s cream cheese spritz wreaths decorated with holly and berries!! My favorite holiday cookie is chewy ginger cookies, with pieces of crystallized ginger inside. My second favorite is rugelach! Last year for a Christmas party I made a “Swig” sugar cookie and added peppermint extract to the frosting and sprinkled chopped peppermint white chocolate on top. They instantly became a new Christmas favorite! I really love any cookie with peppermint in it. It’s my favorite holiday flavor. I love peppermint bark and I think these cookies could be my new favorite!! My favorite holiday cookies are snickerdoodles. All time favorite- my grandmother’s “grasshopper bars!” A peppermint cheesecake filling sandwiched between chocolate crumb. Only made for Christmas Eve parties! Pumpkin oatmeal! But I’ll be making snickerdoodles this year! Can’t wait to try these peppermint bark cookies, they look delicious!! Our favorite Christmas Cookies are Pecan Pound Cake Cookies! My grandmother’s pecan chewies are my all time favorite and must be made each Christmas! 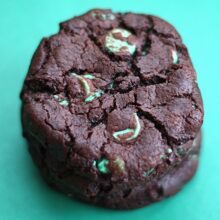 My favorite holiday cookie is Double Chocolate Mint! That mixer is the prettiest I’ve ever seen. Definitely a dream item for my kitchen (which it would actually match soooooo well!!!). My favorite Christmas cookie…how do I pick just one? 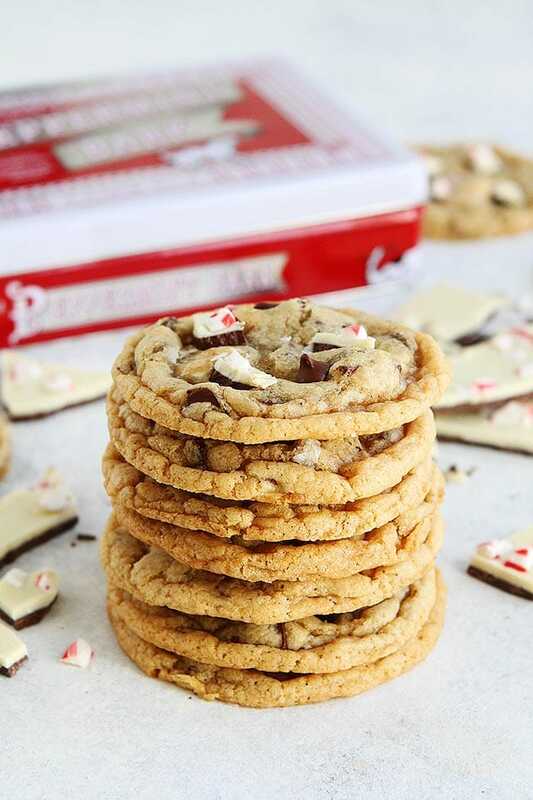 Peppermint bark is my favorite holiday treat so I’m adding these cookies to my baking list but I also love 7 layer bars and buckeyes! My grandmother’s Cherry winks such a weird combination of ingredients but amazing little cookies. My favorite christmas cookie is my family’s sugar cookie recipe. It is a very old recipe and has been updated since the original recipe called for lard. My grandmother’s molasses cookies are always at the top of my list! They bring back so many memories. My favorite cookies are mint chip chocolate cookies! I love peanut butter blossoms! I have a terrific “soft” gingerbread recipe that includes a bit of rum, and it’s a family favorite! I roll them out and cut the shapes with my Christmas themed cookie cutters and then frost them and put sprinkles, etc on them. Yummy!! Thanks for sharing the awesome giveaway too! Happy Holidays to your family. My favorite Christmas cookies are gingerbread cutout cookies. It isn’t Christmas without them. My favorite holiday cookie is my German MIL’s Pfefferkuchen! Little, tasty gingerbread-esque cookies she makes each year and nails to us in the USA. I have yet to translate the recipe and don’t think I could recreate them anyway as the clouds are different, but I hope to one day! Thumb print butter cookie rolled in nuts, filled with apricot jam! I’m from No. California and if I win I’ll give the mixer to a baker who lost her house in the Camp Fire. My favorite holiday cookies are ginger molasses! I LOVE anything chocolate peppermint, including cookies! I was never into it that much but when I got married I drank a peppermint mocha latte for the first time and now Im hooked, because it was delicious and because it reminds me of that time . Every year I drink one on our anniversary. I think peppermint brownie cookies are my fav. These would probably be up at the top for my favorite! My husband introduced me to peppermint bark when we first started dating. I know he will love these cookies too!! I love chocolate peppermint cookies! I love peanut butter blossoms, I remember eating them as a kid and now I make them for my kiddos!!! My favorite Christmas cookies are soft ginger cookies. My all time favorite holiday cookie would be molasses cookies with extra spices. Then probably my grandmother’s pie crust sugar cookies. Thanks for the chance! I am loving your cookie days. I think my fave has become Giada’s lemon ricotta cookies. Oh man WS has the BEST peppermint bark. My fave holiday cookie is probably peanut butter kiss cookies but lately I’ve been feeling gingerbread! My all time favorite holiday cookies are frosted sugar cut outs. I made them with my mom every year and now I get to make them with my daughter! Peppermint bark, not really a cookie but my favorite Christmas treat! I like a perfect sugar cookie that is not too sweet with just the right amount of icing! My favorite holiday cookie has to be Chocolate Crinkles – a classic! Basic sugar cookies are a must during the holidays. Bonus points for cute decoration, but not necessary. My all time favorite holiday cookie is the snickerdoodle. The texture, the flavor… It is all the comfort you need in a bite. Favorite cookie has to be frosted cookie cut outs! So festive and so fun to decorate! Always oatmeal chocolate chip for me. My favorite holiday cookies to make are classic gingerbread men. I love decorating them with all the little ones in our family! My favorites is chocolate chip. Classic! But our family favorite is a snickerdoodle recipe from my my mother in law. She use to make them all the time before she passed and it’s the perfect way to remember her around Christmas time! My favorite Christmas cookie is a pizzele! As tradition, my grandpa would make dozens each holiday season. I would always lick the powder sugar off first before finishing off the remainder of the vanilla lemon zest. The best part would be helping him and the aroma in the kitchen throughout the day. I absolutely LOVE gingerbread! And even though I love it so much I never eat it outside of the holiday season! Theresa just something about freshly baked gingerbread cookies, winter, and cozy pajamas atmosphere that I need! This is such a generous giveaway for a stunning mixer!! Thanks for the chance. I’m in the phase of life (3 little boys) where I’m trying to establish my own traditions and recipes…and although I’m going to try almost every cookie in your site this Holiday (hello 5lbs!! )…my favorite still is my moms sugar cookies. Not because they are my favorite tasting…but because they’re full of my favorite memories. Love your blog… thank you! My favorite all time cookie is a soft and chewy molasses cookie! My all time favorite holiday cookies would have to be between chocolate krinkles and peanut butter blossoms!! Displaced Housewife’s cranberry bark cookies are my new go to for holiday parties! Chocolate crinkles are my favorite Christmas cookie! Any cookie! I cant possibly choose just one! I think I’d choose you triple chocolate ones, if I had too. Me and my sister make How Sweet Eat’s chai snickerdoodles together every year and I love this recent tradition. My family’s favorite Christmas cookies are Peanut Butter Blossoms. We always bake them with chocolate stars in the center. Yum!! My favorite holiday cookie is your chocolate mint chip cookies! Especially right out of the oven! So yummy! These cookies look so good I am going to make them for my dad he loves a mint/chocolate combo, and The mixer is beautiful! My favorite Christmas cookie is pizelles. I make them with my grandma every year and we make around 50 dozen to give to church, family and friends for the holiday season. A cookie filled with wonderful memories! Gingerbread or peppermint mocha cookies! I have a TON OF favorite cookies, but two of my top have to be your peanut butter blossoms (but with dark chocolate kisses) and snickerdoodles!! My favorite Christmas cookie are these little shortbread Christmas tree sandwich cookies my mom made growing up! They are bite sized and just melt in your mouth! I made a new recipe last year. It was Cranberry White Chocolate Chip cookie. Just enough tanginess and sweetness. They’re my new favorite. My all time favorite Christmas cookie would have to be candy cane sugar cookie. As a child we would make half the dough red and then twist the two doughs together to make candy canes. Carried on the tradition to my kids! Pecan Butterballs would have to be my favorite!! I was making a delivery in the icy weather one December and a sweet lady gave me some of these delicious cookies. I have been hooked ever since!! This is the most beautiful mixer! I love a soft ginger snap cookie this time of year! Love making soft sugar cookies cutouts with the little ones! How do you choose just one! I would have to say almond cookies would be my favorite for the holidays. My husband makes the best oatmeal chocolate chip that I can’t get enough of!!! My all time favorite holiday cookie is a very simple one that I started making as a kid but make every year because it makes me feel like Christmas! It’s peanut butter ritz cracker sandwiches dipped in chocolate almond bark! As a kid they used to have butterscotch almond bark but I think it’s been discontinued! Very sad about that. But these can be dressed up with holiday sprinkles! So easy but a fond memory! My favorite Christmas cookies are salted chocolate chip cookies!! Anything with peppermint, so these peppermint bark cookies are right up my alley. My favorite holiday cookie is a gingerbread cookie with chopped up crystalized ginger and lots of spices like cinnamon, fresh nutmeg, cloves and allspice. It is such a holiday comfort food and feels like home when we make them. My favorite holiday cookie is melting moments. They are so light and delicious. I love no bake cookies! I could eat them all day everyday but a good holiday sugar cookie is also delicious! From my childhood memories I’ve loved Mexican wedding cookies for Christmas time! Oatmeal chocolate chip cookies are the best Christmas cookie! Such an underrated kind and always delicious! My favorite holiday cookie would have to be Swedish meringue cookies! The anniversary mixer is just ahhh so beautiful! What an amazing giveaway! Sand tarts!! Hands down. My best friends husband actually makes the BEST ones every year and I look so forward to it. I always hide mine from my husband and my kids lol. My favorite holiday cookies are Swig Cookies. We’re going to have to try these. That look wonderful. Our favorite Christmas cookie is being Grandma’s fudge. It’s a family treasure. After that I did say it would be frosted sugar cookies. My all time favorite holiday cookie are the Santa and Christnas tree sugar cookie my mother in law had for all of her grandchildren every year on Christmas Eve. My all time favorite cookies are my mother’s German Cinnamon stars. Fav Christmas cookie is either a peanut butter chocolate chip cookie or Hello Dollys!!! My dads molasses cookies are my absolute favorite. I make them every year. And of course, peanut butter blossoms! This Heritage Kitchen Aid mixer is stunning! Thanks to you and Williams Sonoma for your generous give-away. Picking a favorite Christmas cookie is almost as difficult as this mixer is beautiful. I am going to go with the ever-classic chocolate chip cookie with nuts. (I also like lovely decorated sugar cookies.) Merry Christmas and Happy, Wonderful New Year to you and yours. Fav Christmas cookie is a peanut butter chocolate chip cookie or a hello dolly! Though my all-time favorite cookie is peanut butter, a holiday favorite is gingerbread. I love how it’s so flavorful without being too sweet. It’s my favorite to enjoy with a fresh cup of coffee! I make Monster Cookies every year for our family cookie exchange party. They are my fav! Thanks for the chance to win! My all time favorite cookie is Orange Tra Drops! My aunt’s classic spritz cookies are an all time favorite and more recently my mother-in-laws pistachio cranberry cookies! Hello Dollies are my favorite! Frosted sugar cookies! We’ve made them every year on Christmas Eve for Santa. And the tradition lives on, even though my kids are now 22 and 20! My family loves the peanut butter chocolate cookies! They are so delicious and fun to make together! I love Mexican wedding or snowball cookies. I’m going to try with candied pecans like you did. Btw I love peppermint bark!! My favorite holiday cookie is peanut butter cup peanut butter blossoms. 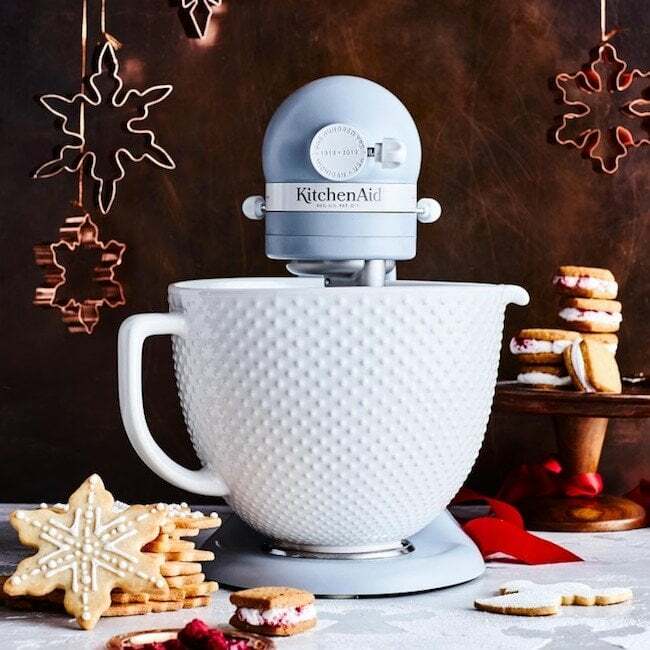 This mixer is so pretty and the peppermint bark cookies sound amazing! They might just become a favorite, too! Wow that is a stunning mixer. My favorite Christmas cookie would be snickerdoodles. I love having them to snack on when we watch our Christmas movies. Chocolate crinkles! I love the fudgy center with the powdered sugar I love the addition of peppermint bark to this recipe! Christmas cookies are the best and I make about a dozen kinds but Chocolate Crinkles are my favorite cookie to make during the holidays. My holiday favorite is pumpkin whoopie pies! My all time favorite holiday cookie is chocolate crinkle cookies!!! These look delicious! I love making my great grandmas cutout sugar cookies! I have fond memories making thumbprint cookies with my grandma every year. I loved the raspberry filling! Favorite Christmas cookies are sugar cut outs made with my 2 boys. We make quite a mess but it is so fun and we create lots of memories! Norwegian spritz cookies. Half dipped in melted chocolate. I love a good chocolate crinkle cookie during the holidays, but these look like they mightn’t be just as good! I love thumbprint cookies with apricot jam! But these looos amazing too as I love the WIlliams Sonoma peppermint bark! I just love a good shortbread. They keep well and aren’t overly sweet. Some tea with a shortbread cookie and I’m a happy girl. My favorite cookie is gingerbread cookies. My favorite holiday cookie is a speculoos! Love the simplicity of the flavors and the texture. My favorite Christmas cookies are Snowflake sugar cookies. My favorite holiday cookies are gingersnaps! We have a famil recipe passed down from my grandmother. I love Andes mint cookies. However, just seeing your peppermint bark I think that will be my new favorite. I love everything peppermint and chocolate. I sure hope I get to make these in the cutest mixer I’ve ever seen. Please enter us in the giveaway. Happy Holidays! I love looking at all types of cookies but chocolate chip is my number 1! All time favorite Christmas cookies are peanut butter kiss cookies. But have to say all Christmas cookies are my favorite! My favorite is truly a simple iced sugar cookie. The perfect buttery tender yet crisp texture with flavors of vanilla and almond just can’t be beat! Those peppermint bark chocolate chip cookies look amazing! My all time favorite holiday cookie are bow ties. It’s a family tradition to make every year at Christmas. My all-time favorite Christmas cookies are the Deep Dish White Chocolate Peppermint Truffle cookies you made a few years back. They are AMAZING. Snickerdoodle is a close second! My favorite are hello dolly bars! My favorite cookie is italian ricotta cookies! My favorite is a classic sugar cookie! My personal favorite cookies are Cake Batter Christmas cookies, Because yumm! My favorite cookies to make are peanut butter blossoms in honor of my Dad. Makes the holidays a little bit easier having a small memory of him still around! I love homemade sugar cookies & decorating them! But these peppermint bark cookies might take the #1 spot here soon! Peanut butter blossoms are my favorite Christmas cookie! German Lebkuchen cut into Christmas tree shapes! Favorite holiday cookies are pecan tassies. So good! Love any cookies with peppermint! Seven layer cookies are a family favorite! CAnt wait to try this recipe! MY favorie CHRistmas cookie is oatmeal with item chocolate Andy cranberry! Fave Christmas cookie? “My mother’s are better than your mother’s” ginger cookies from Once Upon a Tart. Definitely Christmas sugar cookies or snickerdoodles! That makes certain is absolutely beautiful. My all-time favorite Christmas cookie is a gingersnap! My favorite Christmas cookies are classic, rolled out butter cookies decorated with frosting and sprinkles. My favorite cookie during the holidays is a sugar cookie that is decorated with family. They often don’t look professional, but they taste delicious and are fun to make:) Would love to win this, but at the very least I’ll be trying this recipie cause I love peppermint! Favorite holiday cookie was my grandma’s ginger snap cookies- so thin and crispy! My all time favorite holiday cookie has to be peanut butter blossoms. So many delicious memories! Can’t go wrong with gingerbread cookies! The best Christmas cookie is peanut butter dipped in chocolate. SO good! Thanks for doing this give away! Too many favorites to pick just one!! But I do love Andes Mint Cookies and snickerdoodles! I am a sucker for a homemade peanut butter blossom! Good fresh and good a few days later (if you have hidden them well!). My mom’s snickerdoodles are my favorite! The BEST Christmas cookie is chocolate& pecan shortbread. Second to none! My all time fav holiday cookie is good ol bakery style chocolate chip! I’m so looking forward to trying this!!! My favorite would have to be chocolate peppermint cookies, but anything peppermint during the holidays gets my vote! My grandmothers tea cake cookies are our favorite for every holiday! My favorite Christmas cookie is a cranberry, lime shortbread cookie. So pretty! Molasses Crinkles. Followed by peanut butter blossoms! My all time favorite cook are SPECIFICALLY my grandma’s sugar cookies. And she has to make them. They are amazing!!! My favorite cookie is chocolate chip – holiday time or anytime! Williams Sonoma peppermint bark is the BEST! I will try these cookies, but so far, my all-time favorite holiday cookie is gingerbread. My favorite cookie is your ginger white Chocolate. Everyone always loves. Love this! My favorite is a vanilla sandwich cookie with peppermint frosting as the filling. But my son’s would probably say your peppermint bark cookie even though I haven’t made them yet. Peppermint bark is their favorite. My favorite holiday cookie is a sugar cookie recipe that I’ve had for over 35 years. It has cream cheese in it!! You can never go wrong with snickerdoodles! Scandinavian Almond Bars is my favorite. I got the recipe years ago from my best friend, who has since psssed away. I make it every year in her honor. They are easy and delicious! Peanut Butter Blossoms – anytime of the year!! Absolutely has to be peanut butter blossoms. A childhood favorite, still the best today! My favorite cookie is the Cookie everyone knows your eating…The Mexican Wedding Cookie! Powered sugar all over my mouth, but who cares. They are so good! Oh such a hard choice! But I’d say snickerdoodles! Definitely a buttery sugar cookie, dipped in vanilla glaze with Christmas sprinkles! My favorite Christmas cookies are peanut butter blossoms! My favorite Christmas cookie is a classic sugar cutout cookie! With royal frosting! Christmas cookies are the best! My mom made a Vermont Maple cookie one year and it’s a traditional favorite! Brown butter chocolate chip followed closely by snickerdoodles! This mixer is gorgeous! Thank you for the chance to win! So hard to choose a favorite! I think my go-to for the holidays is a soft sugar cookie. Favorite holiday cookie of all time, anise Pizzelle (a Sicilian tradition). Please enter me in the Kitchen Aid mixer contest. Beautiful!!! Our families favorite cookie is a brownie peppermint cookie. The second it gets cold my kids start asking if we can make them. My favorite Christmas cookies would be any of the homemade ones my Italian grandma bakes every year! She makes a chocolate cookie with walnuts and chocolate icing that just melts in your mouth! Yum! Gingerbread S’mores cookies that I made. I combined a S’mores cookie recipe I had already altered with a soft gingerbread cookie and added a mini gingerbread man sticking out on top to differentiate them from my regular S’mores. 🙂 So cute and so yummy! White chocolate dipped ginger snaps all the way!! My new favorite is your snickerdoodles recipe! This is such a tough one because I love ALL the cookies–but anything gingerbread! My favorite holiday cookies are peppermint patty stuff chocolate cookies!! My favorite Christmas cookies are peanut butter blossoms. I love ginger molasses cookies! I honestly love a chewy molasses ginger cookie! I love making Chocolate Chow Mein Clusters. Sometimes I use butterscotch or peanut butter morsels instead… or even chocolate mint. My mom made these when I was a kid and they remind me of her! Chocolate chip cookies are my all time favorite cookie! My favorite Christmas cookie are sugar cookies. My favorite Christmas cookie is my biscotti that I’ve made for years, either almond or snickerdoodle. I love to dip it in hot chocolate or tea. Oh man! How do I choose a favorite cookie?! I think I would have to say chocolate cookies with peppermint bark or crushed peppermint candies. Or the peanut blossom cookies! Yum!! My favorite cookie is a paleo vegan almond flour chocolate chip cookie! But I basically love ANY cookie. Wow, that bark is so addictive and you added it to cookies-genius! Gingersnaps are my family’s favorite Christmas cookie! It’s definitely not the Holiday season without peppermint bark! And that bowl for the mixer! Man, I really need to upgrade mine. The colors and accessories have come a long way since I got my first Kitchen Aid 10+ years ago! It’s beautiful! My favorite to make around the holidays are a chewy molasses ginger cookie! Unpopular opinion here! Not a fan of chocolate and peppermint together haha. I would have to say that my all time favorite Christmas cookie is a peanut butter blossom. It’s honestly my favorite any time of year! My favorite holiday cookies are snow ball cookies. Love having them with cocoffee around the holidays. I bake a lot of cookies for the holiday season ! I get everyone’s special request and wrap them up in cute decorated bags/box’s and send them for Christmas gifts. Who would want homemade cookies for Christmas? My all time favorite to eat and bake is the ultimate triple chocolate chunk cookie with a dash of sea salt ! Sooo yummy !! My all time favorite cookie would have to be my grandmas homemade fig cookies! Chocolate Chip cookies will always be my favorite! Hard to pick just one! Gingerbread! Peanut butter kiss thumb print cookies!! I have to say my all time favorite holiday cookie is decorated sugar cookies, probably because every year growing up we always made them and decorated them as a family. It was one of only a few traditions we had as a family, so I loved it! My moms almomd ball cookies!! My favorite holiday cookie is probably those bitter cookies people give you around Christmas! I know they aren’t homemade, but I could literally eat a whole tin of them by myself! I love candy cane crinkle cookies! My favorite Christmas cookies are definitely snowballs/Mexican wedding cakes/ Russian tea cakes… or whatever you’d like to call them! How about Delicious Balls of Joy?? I love peppermint mocha cookies but these look delicious too!!! I will have to make them! My all time favorite Christmas cookie would have to be these wedding cookies my grandma used to bake when she was alive. They haven’t tasted the same since! Our favorite every year is a soft moist sugar cookie that the kids can decorate with all the sugary toppings!!! My favorite holiday cookie is a recipe I found once for chocolate peppermint biscotti. They are very crunchy and the peppermint tastes very festive! Mm thumbprint varieties aren’t always my favorite! Jam filled or with hershey kisses! My mother in law taught me to make Date Cookies- now they are my favorite. My favorite would be lemon glazed Italian cookies! My favorite holiday cookies are peanut butter and chocolate roll up cookies! My aunt’s Baklava is the best!! So simple and yet so delicious! Perfectly crisp and not too sweet. My favorite holiday cookie is a soft Ginger cookie. My all time favorite Christmas cookie is just a plain old nestle toll house chocolate chip! Somehow I make the best ever, so every Christmas I give them away in treat boxes. And everyone loves it! My all time favorite holiday cookies are the soft baked, frosted sugar cookies that my mom make every year when I was growing up. They have sour cream in the dough and they are extremely moist and soft, they just melt in your mouth! I can only dream of how many batches I could make for my mom using this mixer, it would be a dream come true! I’d have to say my favorite holiday cookie is a good soft snickerdoodle. If its soft it’s the best thing ever. It is a hard choice! I think it is a tie between ginger doodles and peanut blossoms! Mexican wedding cookies are actually my favorite cookie ever. I love nuts and the thick coat of icing sugar is perfect ! At Christmas time my favorites are sugar cookies. I love to make them with the kids and watch them be creative and decorate them. It makes for great family time. Growing up one of my favorite traditions was baking mollasses cookies with my dad. He hates just about every cookie but these and we only make them in December. During the holidays food is such a fun way to remember fun memories and feelings shared with family! My all time favorite cookies are oatmeal chocolate chip! But now I really want to try these, they look amazing! My all time favorite cookie is sugar cookie cutouts! Love to make them and decorate them with the kids! I love Spritz cookies, especially when my mom makes them. I bought old cookie presses on eBay for me and my sister. The new ones just aren’t the same! My favorite holiday cookie is Candy cane cookies. They remind me of all the years sitting with my grandma while she taught me how to roll them just right to get the candy cane shape. I think my favorite holiday treat is fudge. I know I can get that anytime but my mom only makes it at Christmas. It’s not necessarily my favorite cookie, but my Grandmother’s snickerdoodle. It is the only recipe of hers that is 100% in her handwriting, and I found it after the death of our first baby. I baked it until I perfected it and now it isn’t my favorite to make for the holidays, in her honor as well as a reminder that a part of her is here. I love making homemade snickerdoodles. Yum! Thumbprints are my favorite Christmas cookie! Last year I made peppermint cocoa meringues that were easily gluten free, dairy free, nut free so we could all enjoy them! They’ll definitely be our new staple. Peanut butter blossoms are my all time favorite at christmas. My favorite cookie is the peanut butter blossoms!! My favorite holiday cookie is a ginger crinkle!! My favorite Christmas cookie is the PB cookies with a Hershey kiss! Definitely going to try the chocolate sprinkle version you posted the other day! My favorite holiday cookie is a soft ginger snap cookie. I came across a recipe that I love but sadly I missplaced during our move. I love them and try to make them from memory but it’s not the same. My Mom makes molasses cookies every year at Christmas time and I always look forward to eating a few hundred! My favorite holiday cookie is mint truffle kiss cookies. These look amazing though and if I hadn’t just started keto, I would be making them right now! My all time favorite holiday cookie is my homemade fudgy Rolo cookies! YUM! Favorite holiday “cookie” is Christmas Crack (saltines covered in toffee and chocolate). That is such a gorgeous mixer! I can’t pick just one holiday cookie, it’s too hard & there are too many!! I love mint chocolate chip cookies. Gingersnaps. Shortbread dipped in chocolate & then straight into candy cane dust. Russian Tea Cakes. My favorite are Christmas Kisses! Our favorite Christmas cookie is chocolate with candy cane pieces and chocolate chips. I love making Gingerbread cookies in all shapes, then decorating them. Of course I sneak in a few to eat before giving them out. My FAVORITE cookie is Homemade Ginger Snaps!!! What an awesome giveaway! 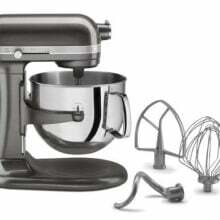 This mixer is absolutely gorgeous, and I’ve always dreamed of owning a KitchenAid mixer. My favorite holiday cookies are buttered popcorn cookies! Snickerdoodles! They are my favorite any time of year, but especially during the holidays! Any chocolate/mint combo comes in a close second! Usually sugar cookies (the kind with almond extract & powdered sugar in them) but honestly I just made your classic snickerdoodles and they might be my new all-time fav. My husband said they are his new favorite! I’m a fan of decorating sugar cookies. But nothing beats a chocolate cookie just out of the oven with a nice cup of hot chocolate on a cold evening. Just perfect. My favorite Christmas cookie is a soft and chewy ginger snap cookie dipped in white chocolate. Yum. But there are sooo many I haven’t tried that look just as good. I need to do some more baking! After making them last year my new favorite Christmas cookie has changed. From sugar cookies to your Mexican wedding cookies! And yes, I agree that the secret ingredient is a game changer. 100%! I’ve already made a few batches for family and friends! My favorite Christmas cookie is a chocolate crinkle cookie, because it’s been a tradition in my family for over 30 years now. Thanks for the chance at winning the beautiful mixer! My favorite cookie is a snickerdoodle!! Not a cookie but my favorite holiday treat is bourbon balls! Love making and decorating sugar cookies with the family! I think I’d have to go with the classic Russian tea cake. So simple, but so delicious!! My aunts Mexican wedding cookies are my favorite to bake this time of year! These look amazing! Can’t wait to make them!!! Looks so delicious! Choose me! Oh these cookies sound amazing!! My favorite…ah I have 2! Old family crescent recipe and a mint chocolate chip recipe from my mother in law!! These look awesome! I’m Mexican, so of course my favorite holiday cookies are Mexican wedding cookies! My favorite is Mexican wedding cookies!! My favorite cookie is a classic sugar cookie with icing! How can I possibly name one favorite Christmas cookie, but I will go with a pistachio thumbprint cookie. My favorite holiday cookie is a Nestle Toll house snowball cookie with mini chocolate chips, covered in powdered sugar! All time favorite is our familie’s recipe for sugar coated chocolate bourbon balls. Yum! Candy cane twists have always been a favorite for the holidays, cannot wait to share this one with family! My all-time favorite holiday cookie is snickerdoodles! You can’t go wrong with this classic! Frosted sugar cookies are the favorite at my house! Peanut Butter Blossoms are by far my fav cookies! But these look like they might be a close second ! My favorite holiday cookie would have to be gingerbread molasses cookies with white chocolate chip icing on top. Peppermint chocolate chip cookies are my absolute favorite. I’ve always loved chocolate crinkles!! But peppermint bark is on the must have list, too!! Can’t wait to try this one! My favorite are the soft gingersnaps dipped in white chocolate that my mom made every year! Can a favorite cookie be chosen? That’s like choosing a favorite child! Snickerdoodles and peanut butter bars may be at the top of the list, but don’t tell the others! Magic Cookie Bars! Technically they are a bar but the name has the word cookie in it sooo…it counts! The gram cracker crumb base, the shredded coconut, the evaporated milk, the walnuts, I can’t choose what I love most about them. So delicious!!!!!!!!! These look so yummy. 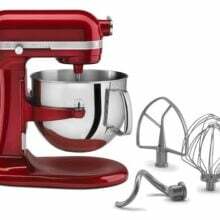 I would love to win this KitchenAid mixer!! My favorite Christmas cookies are ginger cookies with vanilla icing! The recipe has been in my family for generations, and I am keeping the tradition alive for my children! Uh. Could there be a more perfect marriage? Chocolate chip cookies and peppermint bark?! Need to make these ASAP. OMG, you weren’t kidding about that being the prettiest mixer ever! Let’s be honest, is there ever really a wrong cookie for Christmas or any other time? Of course not! But I do always love a fun decorated sugar cookie for that magical, nostalgic Christmas taste. My favorite is peanut butter blossoms. You can really beat the chocolate and peanut butter. My favorite holiday cookie is my grandma’s rum balls. My grandma’s molasses cookies! I make them every Christmas! My all time favorite Christmas cookie is a shortbread cookie dipped in chocolate and rolled in walnuts. So fun easy and delicious ! My favorite holiday cookie of all time is white chocolate macadamia nut and cranberry cookies by Tyler Florence. They have just the right balance of salty, sweet and tart flavors. My favorite cookies are my mom’s disappearing marshmallow cookies, which she makes in her own kitchenaid stand mixer. I have no idea where the recipe is from, except that the recipe is copied onto a card in her file! My favorite cookie to make are pinwheels- a walnut cookie and chocolate cookie rolled up to slice and bake. Well, this cookie looks pretty darn good, but my absolute favorite is a Triple Ginger Cookie I’ve been making for a few years now! Molasses Spice Cookies… I have loved them since I was a kid and it’s just not Christmas without them! My favorite holiday cookie is Millionsire Shortbread. It’s something my Mum made every Christmas and New Year. Layers of shortbread, caramel and silky milky chocolate. Not really a cookie but it’s what I remember the most. My favorite is making cutout cookies with my kids…even now that they are teens it is one of our favorite traditions! I’ve got so many to choose from, that it is difficult to choose. However, I would have to say ginger cookies. The spices in the cookies are just so reminiscent of the holidays! I love Russian tea cakes! Can’t beat good frosted sugar cookie. Favorite Christmas cookies would be butter cookies using the cookie press. My favorite Christmas cookies are peanut butter kisses! So excited to try your chocolate kisses! White Chocolate macadamia nut cookies! I love making your Brown Butter Toffee Chocolate Chunk Cookies for the holiday season as my, or should I say our, all time favorite Christmas cookie. My husband doesn’t really have sweet tooth but inhales them each season! We make cranberry white chocolate chip cookies every year. They have a browned butter frosting….SO good! My favorite cookie is definitely anything with some mint!!!! Such a hard question – all time favorite is just anything with peanut butter and maybe reesee chunks. My favorite holiday cookies are peppermint chocolate chip! This mixer is so pretty!! I think my favorite Christmas cookies are cut out sugar cookies or snowball cookies. These recipe look delicious and I’m going to have to try them!! There are way many to choose from… but childhood memories always bring me back to the snowball cookie. My all time favorite cookies are “pepparkakor” as a kid, I learned how to make Swedish ginger snake while living there. This mixer is beautiful! God Jul! My favorite cookies are chocolate dipped shortbread and peanut butter blossoms. My all time favorite Christmas cookie – a classic peanut butter blossom! I love the soft & chewy ones. My all time fav is maguc dream bars!! I love simple sugar cookie cutouts with lots of sprinkles. Do I have to pick just one favorite? I love them ALL!! My NEW all-time favorite: your soft ginger snap with white chocolate chip cookies. They have such a wonderful holiday spice flavor, perfect texture, rich white chocolate, and they look so pretty with the granulated sugar. Thank you so much for the recipe!! My all time favorite Christmas cookie is my Grandmother’s Santa’s Whiskers. They are rolled in coconut which looks like his beard. My favorite holiday cookies are peppermint chocolate crinkle cookies but these may now beat them! Hmm my favorite holiday cookie are thumbprint cookies with raspberry jam! My boyfriend aunt makes them every year and they are to die for. I actually tried to make my first ever Christmas cookie the other day and realized how hard cooking making is without a stand up mixer! I tried to use my moms stand up mixer that was given to her as a wedding gift back in 1998 but the motor burnt out leaving me to mix by hand. I also am a HUGE fan of the WS Peppermint bark and honestly anything peppermint. I can’t wait to try this recipe on my next cookie baking day!! My favorite cookies are peanut butter blossoms! I think these are about to be my new favorite! I love peppermint bark! My ALL time favorite cookie has to be the classic shortbread cookie. Timeless and easy to make however I can’t ever achieve it’s perfection like mom does :). My favorite cookie to bake at Christmas is my mom’s Italian biscotti! It smells and tastes like home! Merry Christmas! Chewy gingerbread cookies cannot be beat. So much butter but I could eat them all! I love a good sugar cookie. But I also like peppermint so I might have to give this recipe a try. snowballs covered with extra powdered sugar 🙂 although these may have to be my new favorite! I love Rosettes with sprinkles on top! Lots of memories when I was little excited for them. Favorite cookie is a hard one!! While I am obsessed with your brown butter chocolate chip cookies(so is my entire family, I mean every single family member) I’m gunna have to say ginger snaps! Can’t wait to try out these peppermint bark cookies too. Merry Christmas/happy holidays! My grandmother’s almond flavored candy cane cookies! My favorite are our family’s mini biscotti. As kids we’d decorate them in the style of the Italian flag (which, incidentally is perfect for christmas). Christmas is the only time of year we ever make them. I need to try these cookies. My favorite holiday cookie is Peanut Blossoms. We make gingerbread cookies to make houses every year. It’s so fun to decorate as a family. Ahhh!! My favorite cookie is oatmeal raisin!! I love it for all times! My grandma makes the best chocolate chocolate chip cookies. The first time she made them I ate one on the way home from work and basically screamed, they were so delicious. The cars next to me were probably concerned. I love putting the time and effort into making show-stopping pecan pie thumbprint cookies! My all time favorite holiday cookie is peppermint mocha cookies!! Ahhhh!! So many to narrow it down! I love thumbprints and chocolate kisses. BUT my very favorite might be chewy gingerbread! Twisted candy cane peppermint cookies! They’re delicious and picturesque. Perfect for Christmas. Cut out sugar cookies are my favorite, We have a family cookie decorating party every year! I have never thought of putting peppermint bark in cookies, but that’s an INCREDIBLE idea!! Favorite holiday cookie is oatmeal cranberry white chocolate chip cookies :). They are a treasured family tradition. My favorites are buckeyes and peanut butter blossoms! Gingerbread cookies are my favorite! I Amy twin is the big cookie baker but I LOVE snickerdoodles! My favorite Christmas cookie is a good ‘ole sugar cookie. I don’t typically make them often, but definitely do so at Christmastime for the kids to decorate. Molasses cookies! I only recently tried them, and they immediately became a favorite. Sugar cookies with almond frosting! Pecan cups with a shortbread crust that I used to make with my Mom when I was a child. Can’t wait to try this. My favorite holiday cookies are thumbprints! My favorite Christmas cookies are chocolate marshmallow cloud cookies! Oh my goodness that mixer is GORGEOUS! I would love to win it! My favorite holiday cookie is triple chocolate cookies for sure! My favorite Christmas cookie would have to be my mom’s snickerdoodle cookies. They are so soft and sweet! Chewy Gingersnaps are my favorite holiday cookies! I have a hard time choosing – we have a great cutout cookie recipe that always involves my dad frosting a few in his special way. They are always pretty hideous looking, but he tries his best! I also love my moms jam bars – they have to be the seeded raspberry kind. Yum! So important to have these family traditions and wonderful memories! My all time favorite cookie is peanut butter blossoms. They’re the only cookie I make! hmmm tough one with a favorite but I do like oatmeal cranberry walnut white choc chip cookies. Choc chips cookies is always good too, simple but good. My favorite Christmas cookies are Pecan Balls. My anytime of the year cookie is of course, Chocolate Chip cookies. Love your blog!!! Peanut butter blossoms with dark chocolate! Or frosted sugar cookies. Chocolate Peanut Butter Kiss Cookies are my dream!! Look&sound great! Can’t wait to try. Awesome giveaway, thank you! My favorite Christmas cookie is the snowball cookies my Nana used to make! My favorite cookies are pumpkin cheesecake snickerdoodles!!! Even when it’s not pumpkin season haha. My all time favorite is any type of Christmas cookie! I love pecan shortbread cookies dusted with powdered sugar! I love chai shortbread cookies. My friend Beth’s sugar cookies! They are a buttery shortbread type iced cookie. The best!! I love chocolate crinkle cookies!! Favorite Christmas cookie is snickerdoodles. Love them! Those cookies look so delicious! Adding them to the holiday baking list! And OMG that stand mixer is so gorgeous!! Oh! And brown butter chocolate chip cookies would have to be my favorite!! My great grandmother’s cut outs!! I love baking them and decorating them with my son! It is one of my favorite days of the year! My favorite Christmas cookies are Butter Balls. Peanut butter blossom cookies with the Hershey kid in the middle. So Christmas and so simple. My favorite holiday cookie is chewy ginger molasses cookies!! My all time favorite holiday cookie is the chocolate crinkle. I absolutely love my family’s sugar cookies around the holidays! They bring back memories and warm my heart! Peanut butter blossoms — without a doubt! You can roll them in red and/or green sugar to make them a little more festive. My favorite holiday cookie is snickerdoodle. I absolutely love a brown butter cranberry dark chocolate chip cookie. It’s delicious, the cranberry looks festive, it’s an all around winner. I may need to go make some right now! My all time favorite cookie recipe is the cut out cookies my Grandma used to make that now my Aunt has taken over making. I am I too enjoy making and decorating. How much better to make these cookies than with a new William Sonoma KitchenAid mixer. My all time favorite cookies for the holidays are the Christmas Tree Shortbread ones from Bon Apetit magazine – I’ve been making them for almost 20 years now! Although those peppermint bark cookies look pretty spectacular too! My favorite holiday cookies are lemon sugar cookies! Sugar cookies are delightful this time of year; especially when they are decorated beautifully! I absolutely LOVE this beautiful Kitchen Aid Mixer!! We love making and decorating sugar cookies at Christmas! This beautiful mixer would make it much more fun! Snowball cookies! I lose all my will power in front of them! Snickerdoodles!! Usually I love anything chocolate but st the holidays, these are my fave. I am SO basic but my favorite cookie is a classic homemade chocolate chip cookie. But let’s be real, I’ve never met a cookie I didn’t like. Bird’s nest cookies are my fave! My favorite holiday cookie is my mom’s gingerbread men. I have tried to match the great texture her cookies had but have only gotten close once to matching the taste and soft yumminess only she could bring to this Christmas tradition. My most favorite is an iced sour cream sugar cookie! These cookies look amazing! I must try! my favorite cookie for the holiday season has to be a copycat levain bakery chocolate chip cookie!! My favorite cookie ever is a Milk chocolate cookie off of the Ghiradelli package.. perfect every time!! Our usual go to is cut out cookies this time of year but this year so far we are loving cranberry white chocolate chip cookies. My favorite cookie is homemade Oreo cookies. I make them every year for my family. My favorites are ginger molasses cookies with lemon icing! This mixer is beautiful! My boyfriend and I would love to hve one so we can bake together! (He actually loves making cookies!) One of my favorite recipes is your chocolate chip cookies with the chunks, chips, and shavings with sea salt on top! Amazing! I love sugar cookies at Christmas!! But really, any cookie will do. Mini Chocolate Chip Snowballs. Like a Mexican Wedding cookie. I make them every year 🙂 Definitely making these Peppermint Bark cookies for my work Christmas party! Thank-you for the recipe! My favorite is Oatmeal raisin chocolate chip with roasted pecans. I love all cookies! I love making cookings and giving them to people. Springerles! We use my great-grandmother’s Recipe for these traditional anise flavored German cookie! My all time favorite Christmas cookie is the Biscochitos they are very popular here in New Mexico so popular that they are our official state cookie. My favorite holiday cookie is an oatmeal trilby. My mom made tons of cookies only at Christmas and this one was always our favorite. They’re basically like oatmeal cream pies in cookie form. But better. I now make them en masse for friends and teachers etc at Christmas and it’s the only recipe I won’t share…because people love them so much and then it’s that much more of a special treat to give them each year. Can’t choose just one favorite cookie!. My favorites are Chocolate Chip cookies, Snickerdoodles, Oatmeal and No Bake cookies. My favorite Christmas cookie is a buttery shortbread half dipped in chocolate with toffee bits sprinkled on top. I love good classic sugar cookies!! My favorite cookie by far during the holidays is a classic snickerdoodle. However, I really want to try making the chocolate snickerdoodles you posted about the other day and see if they become a new favorite! Also, that KitchenAid is so beautiful! I think this cookie is going to become my new favorite cookie! I love the peppermint bark and chocolate chip cookies. I do love to make zebra cookies too! Decorated Gingerbread cookies are a big tradition in our family. I love an Iced Sugar Cookie during the holidays! Cranberry orange cookies and chocolate drop cookies are my two holiday favorites. Ones an oldy that brings back great memories and the other is a fairly new favorite. My favorite holiday cookies of all time are Russian Tea Cakes. The recipe came from the neighbor who lived across the street from my childhood home. She would bring them over every Christmas for my family and shared the recipe with me when I started baking on my own. They remind me of family holidays growing up. I love them! My favorite holiday cookies are probably good old fashioned gingerbread cookies! Just as much fun to decorate and eat! Favourite holiday cookie, homemade buttery shortbread. My ginger cookies are tops on my list for Christmas! However, I have to bake on Tuesday for my daughter’s high school Winter choir concert and the Peppermint Bark CC cookies sound perfect! My go-to cookie during the holidays is a dark chocolate caramel filled cookie! But these cookies sound amazing! These are definitely going in my Christmas Cookie care packages! THe mixer is beautiful! I love chocolate chip pistachio cookies. They are my year round go to recipe! My favorite Holiday cookie is Chocolate Peanut Butter Turtle cookies. My all time favorite Christmas cookie is a blondie! They’re tasty year round! Sugar cookies all the way!! Oh man, all time fav holiday cookie?! That’s tough! But I’d have to go with this shortbread cookie my mom makes, dipped in dark chocolate and covered in almonds. It is TO DIE FOR! I love a traditional sugar cookie with smashed candy canes in it! I only make it at the holidays and they’re absolutely amazing! My favorite cookie is your red velvet cream cheese cookie! Yummy!! These sound deeeelicious!! And my favorite holiday cookie has to be gingerbread! My favorite Christmas cookie is a spritz with strawberry jam filling and the ends dipped in chocolate with chocolate sprinkles. My grandma made them and now my mom makes them. They are amazing! OMG – so hard to pick, BUT it will have to be a Snickerdoodle recipe I’ve made forever. I add red and green sugars to roll the dough in for Xmas colors!! My favorite Christmas cookie is actually a cookie sandwich. It’s a red velvet cookie with white chocolate amaretto frosting, rolled in festive sprinkles. Thanks for the chance to win the beautiful mixer! Our favorite holiday cookies are the double chocolate chip with candy cane! we love snowball cookies at our house! OMG, these look amazinggg !! My favorite holiday cookies are sugar cookies for their unlimited shape and icing flavors! Sugar cookies are a staple at my house during the holiday season. I grew up making them every holiday with my mother in the kitchen. It’s one of my greatest memories. I’ve continued the tradition with the kids I’ve nannied and hope to do so with my future kids someday. I can’t wait to bake these peppermint chocolate bark cookies. They look delicious! Our favorite Christmas cookies are sugar cookies…. we love to decorate them as a family (and of course make special ones for Santa!). Hi!! My currently my favorite cookie is a chocolate peppermint cookie! I love peppermint this time of the year too!! That’s the most unique twist of chocolate chip cookies looks so delicious I can’t wait to try it!!!! Favorite Christmas cookie is chocolate cherry. My favorite cookie is white chocolate macadamia !! And peppermint chocolate chip. Second is my grandmas peanut butter cookies. My all-time favourite holiday cookie is Molasses-Spice Crinkles Cookies. You cannot just eat one. The best! Love this! Will be whipping this up for my students! I would say hands down my favorite holiday cookie is gingerbread! Chocolate chip is my favorite cookie, and the holidays are no exception. Happy Holidays! My all time favorite holiday cookie is chocolate biscotti. My mom makes them with a delicious blend of milk and white chocolate swirled over the top! To die for!! Mexican wedding cookies aka Russian tea cakes. Whatever the proper name is, they’re delicious and giftable! You had me at peppermint chocolate bark! Love all things mint in this season! My favorite cookie for the season has to be the shortbread cookies. Simple but oh so yummy! My all time favorite Christmas cookie is a Snickerdoodle! My favorite cookies are Pizelles, an Italian wafer cookie my family has been making every Christmas for as long as I can remember! My favorite cookie is a Swedish gingerbread cookie called pepparkakor. Literally can eat a whole batch myself . My old time favorite holiday cookie Frosted Pepermint Brownie Cookie. Peanut butter chocolate chunk cookies are my holiday favorite! I LOVE Almond Candy Cane Cookies. It wouldn’t be Christmas without them. My fave holiday cookies are my Grandma’s Pffernüße cookies! My favorite Christmas cookie is gingerbread with icing! I can’t wait to make these with my daughter for Santa! My favorite is the classic chocolate chip cookie and I still use the recipe from the back of the nestle toll house chips, although I’ve got it memorized by now. I’ll absolutely have to try out this recipe though! Brown butter snickerdoodles! The cinnamon is perfect for the season. My favorite holiday cookies are bizcochitos, the New Mexican State cookie!! Oh! How do you pick just one ‍♀️‍♀️‍♀️ I would have to say chocolate crinkles. It’s the only time of year I make them. Then sugar cookies bc… kids! My ALL time favorite Christmas cookies would have to be the Peppermint Bark Chocolate Chip Cookies!!! I would honestly have to say my favorite would be some good, old fashioned gingerbread men. I love the snap of the cookie and the spice of the ginger…and even though my kids are a little older now, they still love our tradition of making a homemade gingerbread house, from scratch, the weekend before Christmas. My favorite holiday cookies are called “nana” cookies which are actually a sugar cookie with apricot or fruit jam in them with a holiday shape cut out and powdered sugar on top. And of course, made by nana! My MIL’s nut balls. So so so good. Oh my those cookies sound AMAZING!! Can’t wait to try them! And super excited to enter this give away! What a gorgeous mixer!! My favorite holiday cookie to make would have to be sugar cookies. My favorite holiday cookie is the classic sugar cookie….with icing and sprinkles on the side for a fun decorating activity. Best way to spend an evening with friends or family! My favorite holiday and anytime cookie is snickerdoodle! Similar memories with my own grandkids. My grandmas’s Sugar cookie recipe. She always had these on hand during the holidays. 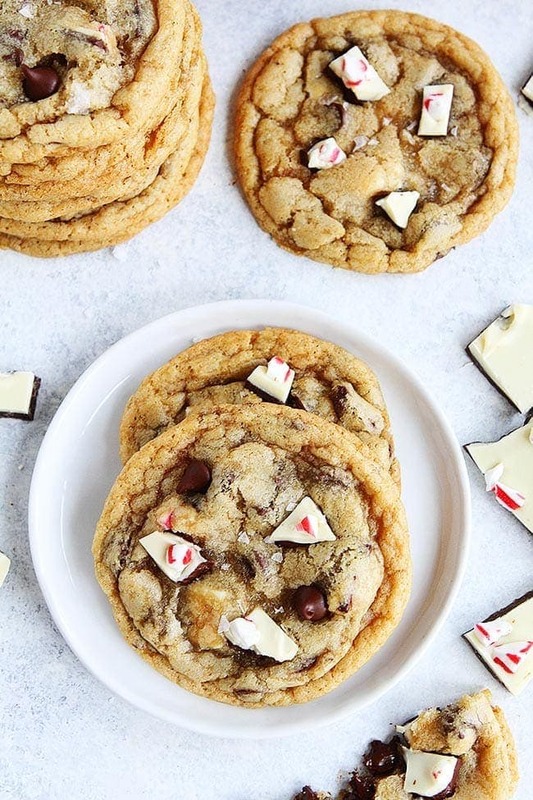 Chocolate chip cookies are by far my favorite treat and adding WS Peppermint Bark topped with flaky sea salt really makes them festive and holiday perfect! I cannot wait to try these! OK no joke, this may become my new favorite cookie. But we love making a white chocolate and cranberry cookie. Sweet tart and delicious! My favorite holiday cookies are the ‘no bake’ peanut butter, oatmeal, & chocolate cookies my grandma has made at Christmas ever since I can remember! Can’t wait to try this recipe! My favorite Christmas cookie is a peanut butter blossom. I love your recipe for the iced sugar cookie. They are the bomb! My all time favorite is candy cane cookies. There is nothing quite like those buttery mint treats! My favorite cookie is a crunchy peanut butter cookie. It’s made with frosted flakes and rolled oats. Delicious! However, can’t wait to try this one! I love a frosted sugar cookie this time of year. It has to be homemade though. My all time best holiday cookie is mint chocolate chip! Love adding the mint for the holidays! Italian rainbow cookies!! Love the chocolate and almond flavors! My favorite, and now all my grandchildren’s favorite, are my Aunt Kay’s ginger cookies. My sister took on the tradition of making them and now my daughter carries on. Pecan cookies with powdered sugar. First cookies I ever learned how to make. I love a really good shortbread cookie. I actually have two favorite cookies. They would be butterscotch chip cookies and iced ricotta cookies. The ricotta ones are only done when I know I have the time for them. Cherry Winks…My Mother used to make these and I took over when she passed. These cookies will forever be Christmas to me. I’ve been making them for years for my kids. Definitely your chocolate chip cookie! I tried it yesterday & is now my all time favorite! 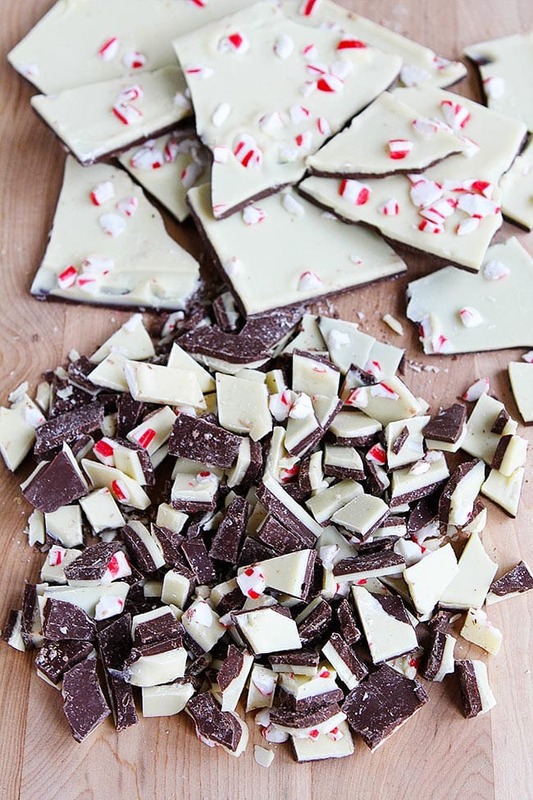 Will definitively be trying with peppermint bark from Williams Sonoma!! Christmas cut outs ! A group effort that makes memories! Favorite Christmas cookies are my very own sugar cookies! My favorite holiday cookie is a chewy ginger molasses cookie. I put extra ginger in mine. I love ginger! Chocolate Mint cookies are a family favorite. This mixer is so beautiful with the ceramic bowl!! My favorite cookie is my three chip chocolate chip cookies. My favorite all time cookie recipe is oatmeal cherry-raisin. Chocked full of Cherie’s and toasted pecans…and a little sea salt sprinkled on top! Think I’ll make some today!!! My favorite holiday cookie? Linzer cookies! They’re pretty, delicious and something I only make for the holidays. But I’m eager to give these peppermint bark cookies a try — they look delightful! My all time favorite cookies is the simple cut out gingerbread man! Flavor and nostalgia wrapped in one cookie! My new favorite holiday cookies are s’mores sandwich cookies with burnt marshmallow icing. May not be totally holiday-ish, but just had a cookie exchange and got tons of comments on how yummy they were! My favorite cookie is the gingerbread man. Gingerbread cookie dough! Sneaking it when my mom is making gingerbread cookies so we can decorate them all! My favorite cookie to make is chocolate chip shortbread cookies. My favorite Christmas cookie is Pan de Polvo. They aren’t really just for Christmas but that’s when my grandmother made them. They are soft, melt in your mouth, cinnamon sugar goodness. I love shortbread. I know it’s plain but I love it. Linzers, thumbprints, tea cakes. I’m in! Favorite holiday cookie is frosted cut out cookies. My favorite Christmas cookie, or cookies, are all that my Mom makes every year at Christmas time. She has done it my whole life (a really long time – 47 years! ), and they are not only delicious, they also remind me of being a kid at Christmas, which my Mom has always made so incredibly special. My favorite is the spritz cookie in different holiday shapes! These look amazing, I love chocolate and mint together! I’ll try to make these this weekend! My favorite holiday cookies are the pine nut pignoli cookies with just a little powdered sugar dusted over them! Chocolate peppermint crunch cookies! I can’t stop eating them! Soooo good! My favorite cookie would have to be the pecan snowballs. This Kitchen Aide is Gorgeous! My favorite holiday cookie is abn Dark Chocolate Cookie dipped in ganache with Peppermint candy canes sprinkled on top. I can’t remember the name but it came from you guys! Miss you guys. My favorite holiday cookie is a buttery spritz cookie! My favorite Christmas cookie is Russian Tea Cakes. They are easy to make and delicious to eat. I make them every year. Chocolate peppermint in ANY cookie!! Frosted Sugar Cookies are my favorite to make and eat. Thanks for all your recipes. It’s hard to pick just one, but probably peanut butter blossoms. My favorite cookies are chocolate crinkles. Roll them in powdered sugar and they crinkle and crack open as they bake. All time fav Christmas cookie has to be lavender shortbread!!! My favorite cookie is an orange cranberry sugar cookie I started making a few years back…so light and tasty! 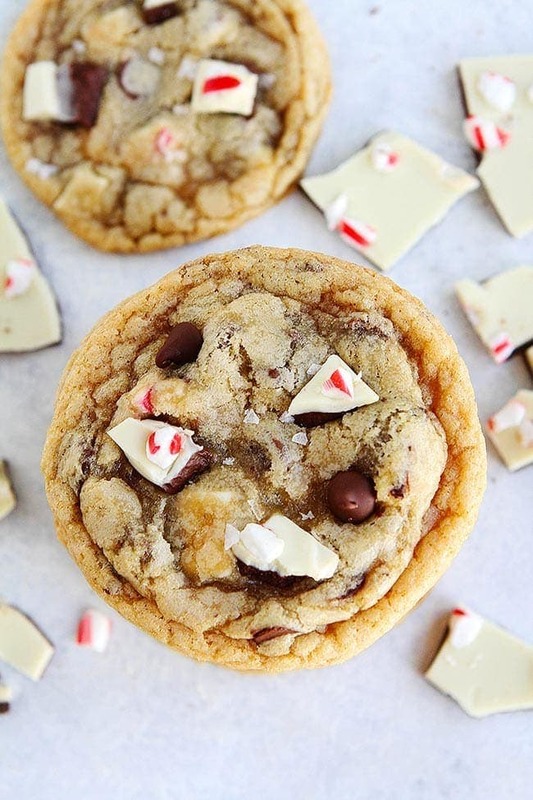 These peppermint bark chocolate chip cookies look divine!! Our favorite cookies are snickerdoodles! I would gladly share the recipe. I can’t wait for my grandchildren to come over and help me make both of these yummy cookies! Merry Christmas!! The simplest cookie of them all, classic sugar cookie, would be deemed my favorite! I rate this as my favorite not for the simple sweet and familiar taste, but rather for the sweet little hands that desire to make Christmas shapes from the dough. The sweetest and most joyful moments of the holidays can be found in our kitchen! The holidays wouldn’t be the same without the cut out sugar Christmas cookie “bake off” tradition and my kitchen floor covered in sprinkles! My favorite cookie this time of year are my grandmother’s chocolate mint sandwich cookies. Just had the best cookie last night at a Christmas party! I don’t know what it was called, but it had saltines, peanut butter, chocolate and brown sugar and butter. All layered! It was amazing! My favorite holiday cookie has to be the simple sugar cookie—especially when I get to decorate it! It’s not Christmas if I don’t make molasses cookies! Sooo soft and gingery. What a gorgeous mixer! My favorite holiday cookie is the good ole chocolate chip cookies. Classic! How Sweet Eat’s has a bourbon soaked cherry oatmeal cookie that I absolutely adore! I make them every year! Love making lofthouse style with Christmas sprinkles! My favorite are mantecaditos ( spanish shortbread cookies). I wanted to thank you for putting the ingredients value after your recipes. Much appreciated! My favorite is the good ole sugar cookie frosted of course! My mom’s chocolate chip cookies! My favorite holiday cookie is the Snowball. Swedish Cremes. The perfect little bit of creamy sweet – so pretty with sugar sprinkled on top. Very special family recipe. My grandma’s sugar cookies were the best! My favorite holiday cookie are gingerbread cookies.. I love the taste of molasses with the hints of cinnamon and nutmeg. This is going to be my new favorite Christmas cookie!! Shortbread cookies are my favorite, but I love them all! My all time favorite holiday are sugar cookies cut into fun shapes! Kids love picking which cookie cutter to use. I can still remember choosing the angel shaped on when I was young! I can’t wait to make these during break! They look amazing! My all time favorite – chocolate chip peanut butter! My favorite Christmas cookie is Anise Soft Italian Biscotti. My grandmother always made these and I have taken over for her. My favorite Christmas cookie is seven layer cookies! My favorite holiday cookie is just like your recipe. Anything with chocolate and peppermint! My all time favorite Christmas cookie are my 83 year old aunts sugar cookies. She used to wrap up a big box of them for me every year. I would hide them under my bed so no one would eat them! Nothing fancy but oh so good. Ricotta cookies! So fluffy and just the right amount sweet’. I love the Mexican wedding cookies with pecans. And that Snowflake mixer, too! My all time fave is jam thumbprints! Only make once a yr! TY! Our favorite Christmas cookie is the Anise Cookie. The recipe is from my husband’s family in Buffalo, NY and uses 1 whole bottle of anise extract in the dough, and more in the frosting. Yummy! My all time favorite cookie is my cut-out cookie to decorate and give away! I love my mother in law’s baklava!!! It’s heavenly!! This may sound old fashioned, but it is my favorite is oatmeal raisin. My daughter learned to make them. She makes them soft and chewy. An oldie but a goody. That mixer is gorgeous! So many cookies to choose from! I’d have to say I love ginger snaps but frosted sugar cookies are a close second! I love to make my mom’s peanut butter cookies with a chocolate kiss on top. They are the best! I didn’t have a favorite Holiday cookie before but I might now after I try these! Love, love love this mixer! My all time favorite holiday cookie is snickerdoodles. Let’s try this again…I don’t make them just at Christmas, but I’d choose Orange Sugar Cookies. I don’t remember where I found the recipe, but the orange zest and OJ in the cookies and in the icing are amazing! My mom’s almond spritzer cookies are my favorite! It reminds me of an almond patty but in a cookie form. They are so tasty! She always makes them into a wreath shape for the holidays. My favourite holiday cookie – Swedish Kringle! Love the bark for gifts!! My favorite holiday cookies are snickerdoodles and of course decorating sugar cookies with the kids! So fun. My all time favorite Christmas cookie is real handmade Scotch shortbread. A nurse I worked with years ago taught me how to make these. I make them every year. My favorite Christmas cookie has always been a jam thumbprint. I’m not sure if the cookie or the mixer is more beautiful. Sugar Cookies and Chocolate chip. I love sugar cookies with extra icing! My favorite Christmas cookie is Cranberry Orange cookies that I found on Allrecipes. My favorite color to gift at Christmas is a spicy ginger cookie with molasses. They bake so evenly and it’s just a beauty plus it’s delicious. Thanks for a chance to win this beautiful mixer. My favorite Christmas or any time cookie would have to be Chocolate Chip. Years ago I showed my husband how to make Chocolate Chip Cookies and he has perfected it. I love them right out of the oven. My favorite Christmas cookies are affectionately known in our family as “Grandma Cookies”. It is a simple cookie dough that is put into a cookie press with a flat ruffled attachment after the 2-3 inch cookie comes out of the press, it is sprinkled with red, white, and green nonpareils before baking. This cookie has been passed down through the family for years. They are the perfect little cookie treat in a in a square tin box all wrapped for Christmas! My childhood favorite was and still is the peanut butter blossoms with the chocolate kiss. Your version of it is amazing! Soft with the chocolate all melty from the oven! My favorite Christmas cookie is a frosted and decorated sugar cookie! Especially if there is a hint of almond flavor. We love to make chocolate cake mix cookies. They don’t last long around here!! I love all things cookie, but am currently loving red velvet chocolate crinkle cookies. I have a lot of different type of cookie that I like but one of my favorites has to be the Chocolate Chip salted caramel. Snickerdoodles! My mom always makes an enormous batch and we eat them all day with a mug of cider or coffee in hand. My favorite childhood Christmas cookies are butter scotch haystacks. My mom used to make them every year. Looks amazing! I hope I win so I can make this at home for my family! My favorite Christmas cookie is a starlight mint surprise. It’s a recipe that’s been in the family forever! My husband is a chocolate mint addict, so I have to try these! Maybe when I’m doing round 2 of Christmas cookie baking next weekend. My favorite holiday cookie is the “Italian brownies,” which are more like chocolate chip spice cookies, my grandmother used to make. Of course mine don’t taste exactly like hers, but they’re still pretty tasty. My mother made Kieflies cookies which I loved to help her? They were so delicious! I sure miss eating her cookies. I think I am going to make them this year Yummy. I love Fruitcake cookies at Christmas time. My mom made the best! My favorite Christmas cookie is Scandinavian Almond bars! I make these every year. That mixer is beautiful! Your toffee shortbread cookies are one of my favorites…they never last long around here! My favorite holiday cookie is frosted sugar cookies. I enjoy making these cookies with my daughter. If it had to pick just one, I love spritz cookies. So fun to make! My favorite holiday cookie is a traditional thumbprint cookie that my Mom used to make. My all-time favorite cookie is the peanut butter kiss cookie. It’s the one cookie I always remember making with my grandmother at Christmas. I will always make them in memory of her. She was a great grandmother! Favorite cookie at the holiday is my Moms Chocolate Chip Cokie with walnuts! Yummy! My absolute favorite holiday cookies are swig sugar cookies! My friend Aimee always makes them during the holidays. My favorite Christmas cookies are old fashioned cookie press cookies. It has become a tradition that my two grandchildren make them with me every year. The cookies have changed a bit as the kids have grown but they are still made with love from Nana, Kingston and Marlo! Merry Christmas! Oatmeal Crispies- it is a childhood family favorite! I love mexican wedding cakes! My absolute favorite Christmas cookie are the Christmas tree cookies (just little shortbread cookies) that my grandmother and mom have made for as long as I can remember. It’s definitely a family tradition, and I can’t wait to make these for my kids someday! Our favorite holiday cookie is a Rugelach. It’s a recipe my grandmother used to make and passed on to us. Christmas isn’t Christmas without rugelach! Molasses cookies would be my favorite christmas cookie! My all-time favorite has to be the krumkake, which my mom bakes every year. Though I have to say, Christmas cookies in general are always the best cookies! My family makes these cookies called chocolate pillows. It is basically sugar cookie dough made into a row with a cookie press with chocolate bars on top and then another row of dough. Then they are cut into bars and sprinkles go on top! I make them with my grandmother every year and it wouldn’t be Christmas without them! Mine would be ginger molasses cookies! I would have to say that Stained Glass Cookies are my favorite at Christman, mostly for the memories of making these with my Grandma every year and then hanging them on the tree for the family to eat on Christmas eve at our big family party with all the Aunts, Uncles and Cousins. Good tradions and great memories to hold dear. I love making huge batches of chocolate chip Cowboy cookies. Basically, a cross between chocolate chip and oatmeal cookie. Your peppermint bark is also amazing and beautiful in Christmas tins. Nutella cookie cups! 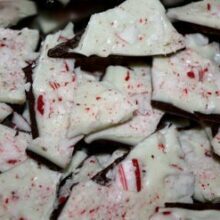 I can’t wait to try these, I live for holiday time peppermint bark! My favorite cookies were my Mother’s thumbprint cookies with amaretto icing. I’ve tried to make them several times using her recipe, but they never turn out as good as hers. I would have to say that Stained Glass Cookies are my favorite at Christmas, mostly for the memories of making these with my Grandma every year and then hanging them on the tree for the family to eat on Christmas eve at our big family party with all the Aunts, Uncles and Cousins. Great memories to hold dear. My favorite holiday cookie? Just one? I’ll go with ginger molasses. Just screams Christmas to me. My favorite Christmas cookie is just the simple frosted sugar cookies I make with my kids! Butter frosting = yum! My favorite cookie to bake for the holidays are snickerdoodles! There are so many good ones! But probably biscotti. They just smell and taste like Christmas. I love my grandma’s sugar cookie recipe with the colorful frosting on it. It has a unique flavor from most and it a bit challenge to make but delicious. I also love my other grand mother’s chocolate crinkle cookie. She’s been gone a long time but the recipe lives on. I love gingerbread cookies. I want to try your recipe for soft gingerbread cookies. I love the mixer!